The Citizens’ Assembly members examined Ontario’s electoral system – the system that structures how votes get combined to elect Members of Provincial Parliament. The Assembly was to report back to the government to recommend possible changes to the electoral system. Objective was to have the members canvass other Ontarians in their ridings and hold information sessions to garner feedback to ensure that we have the best system in place moving forward. The program organizers needed to create educational assets to help the members understand the various options, as well as for these members to use when making presentations to the members of their ridings. Piccadilly was tasked with creating the character “Billy Ballot” and working with the organizers of the program to create the animated, Flash version where Billy travels to other countries to demonstrate the various electoral methods. The content was made available via their website and burnt to DVD for remote distribution and use in schools, at meetings, etc. Piccadilly also created various printed assets to compliment the animated/on-line assets, creating an integrated package of educational tools for use in the field. In Toronto in May of 2007, the Assembly formally made their recommendations to the Government of Ontario, specifically that Ontario adopt a Mixed Member Proportional system. 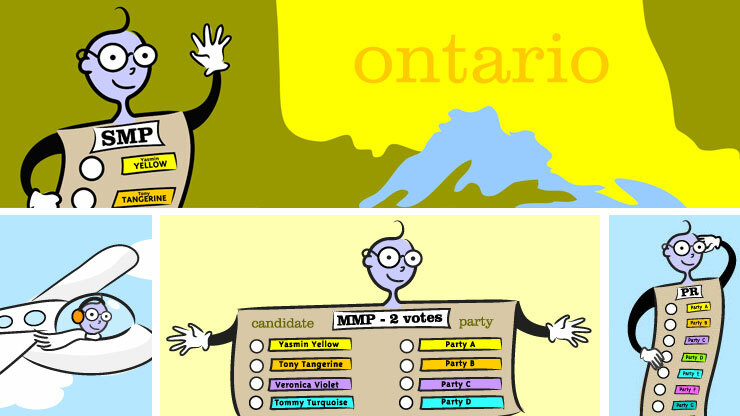 A referendum was held in October 2007, where Ontario voters were asked whether they supported the Assembly's recommendation for a MMP system for Ontario. The change in system was narrowly defeated. The materials are still being widely used in the provinces primary and secondary school systems to help teach about the various types of electoral systems used around the world.